I'm going to read much more than participate, I don't have much time left with real life things, but being connected gives some advantages over being banned. What a nice surprise... I wish things like this would happen more often..
You are welcome! Your avatar is also one of the best I have seen on VgChartz to be totally honest with you. 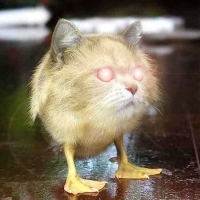 It's just a lame joke, I photoshopped a catduck image to make it look like a helghast. I still remember the PS fans Killzone fever. Eh.. I still like it.. Are you planning on posting more often here? More often than the last months where I was banned, sure, but with my wife and all the work at the office I don't have all that much time to begin with. I would just like to say that if you'd ever like to return that you would be more than welcome. I came back, now it's your turn. Thanks agsain for the link you provided yesterday. I read some articles there today and it is really very nice stuff to read! The guy who writes them used to work (I'm not sure if he still does it) for the developer of Just Cause games, he was the main culprit of their engine. i try my best!!! Look out for this thread! It'll be done weekly! Mi novia quiere que nos casemos y tengamos hijos y la hostia.....como es la vida, pero si yo era un chaval hace dos dias! Yo es que llevo ya cinco años con mi sufridora, es un poco lo que toca. Cuando llevas muchos años con "vida de adulto" en pareja, lo de la boda es como un paso más. No creo que cambie mucho mi situación, pero si quiero tener mocosos, me gustaría estar casado con mi novia, es algo mental. Are you gonna buy the WiiU? You live in Europe? I live in Spain. I'm not going to buy a WiiU at least in the next year, I'm going to marry my long time girlfriend, so I will have to pay for much more important things than videogames. PS: My name comes from a SciFi book named Dune, I read it when I was 14 and I've been using it since then. Accept what you are? What should I accept? What are you calling me? I'm saying that what you do is what you are. You behave in a way, you are that way. I'm not going to name call you, everyone sees what you are. Yeah, as my profile says, I think I'm a level headed guy and open minded. I'm not sure what you're implying, tell me what you think about me, don't be vague, there are words for it. I've told you, I'm not going to fall in your trap. You signal yourself because you are the extreme opposite of a level headed guy and an open minded guy. What you say is not true. I'm a level headed open minded guy. I listen to everyone and I want to listen to you, but I'm not sure what you're getting at since you're so vague, and disapprove of what I am without being specific. I can't believe that you are still trying to make me fall in the trap. Everybody knows your reputation, I don't have to say anything more about it. Trap? Nothing is a trap in a conversation between gentlemen, I wanna make sure what you're getting at, thats all. Don't be a vague critice of who I am, tell me as it is. You are a strange guy, Turkish. Strange in a sad way. Sometimes I don't know what to think, and I don't want to provide him a way to try to ban me. I'm not talking about you, but some young mod is too easy on the ban button. It seems some people got offended by my last status. I'm sorry, but if some fanbase call idiotic to other users due to their opinions, I don't feel any pity for them.